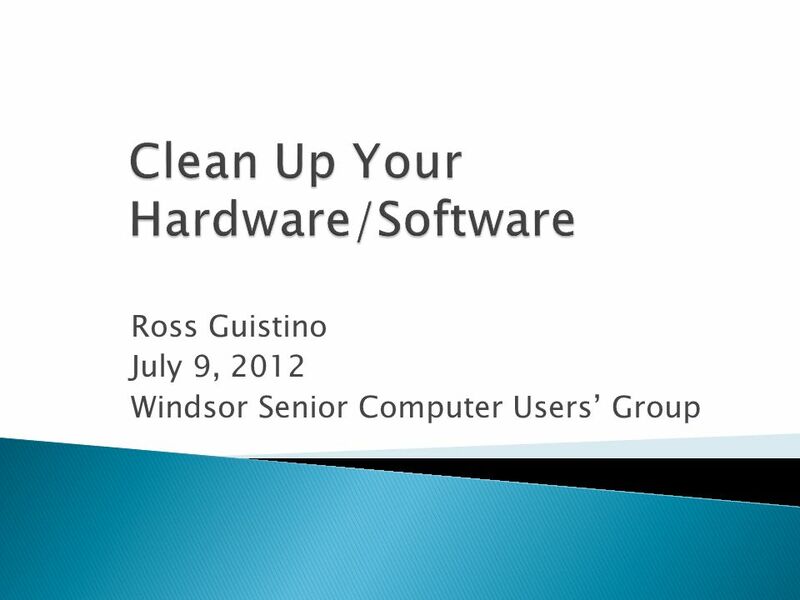 Ross Guistino July 9, 2012 Windsor Senior Computer Users Group. 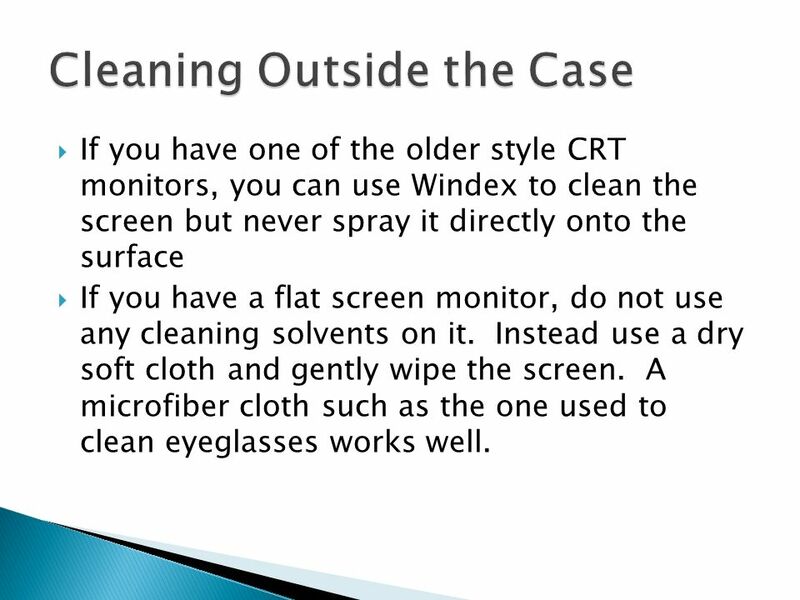 11 If you have one of the older style CRT monitors, you can use Windex to clean the screen but never spray it directly onto the surface If you have a flat screen monitor, do not use any cleaning solvents on it. 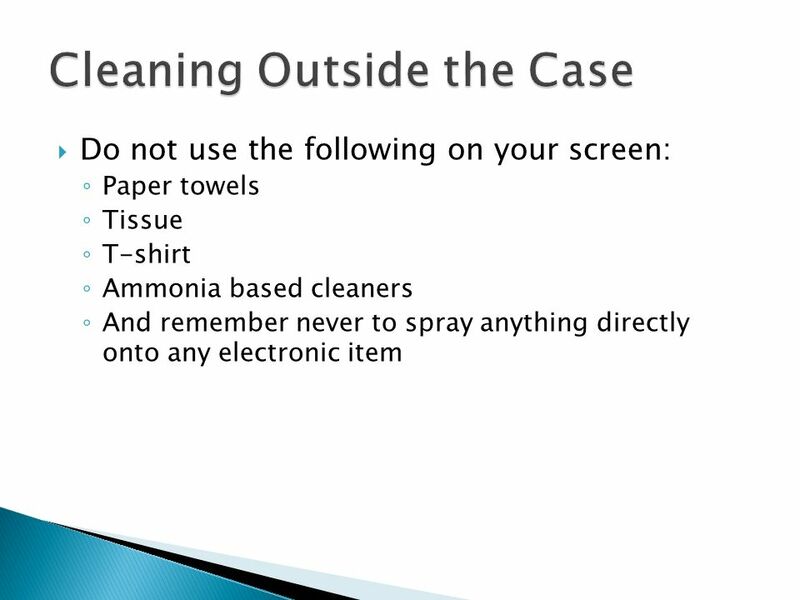 Instead use a dry soft cloth and gently wipe the screen. A microfiber cloth such as the one used to clean eyeglasses works well. 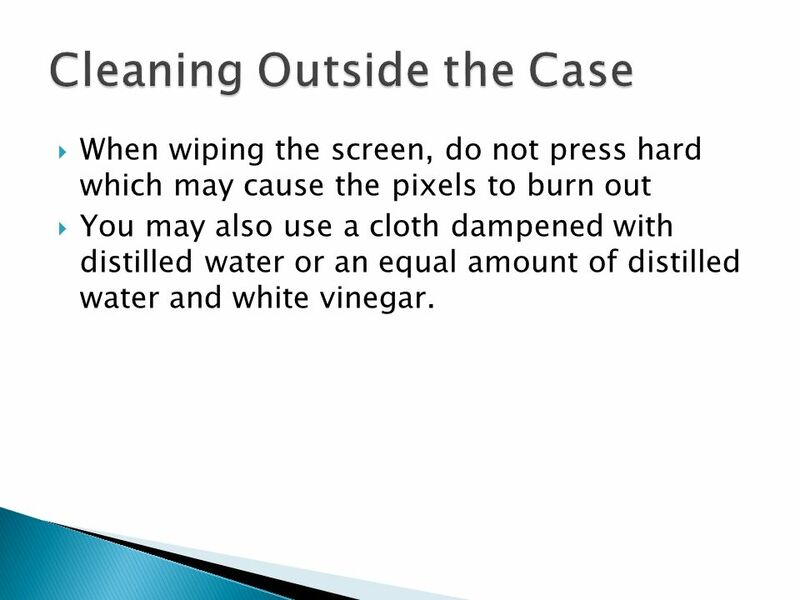 12 When wiping the screen, do not press hard which may cause the pixels to burn out You may also use a cloth dampened with distilled water or an equal amount of distilled water and white vinegar. 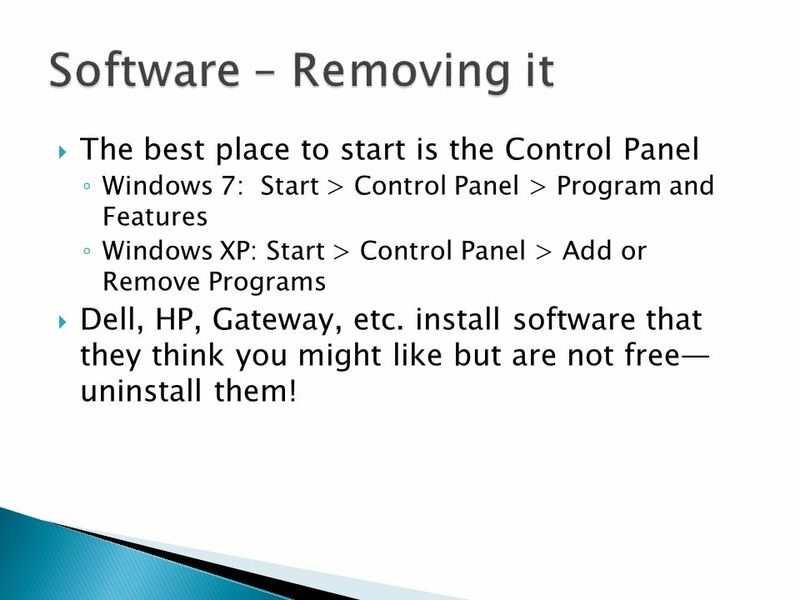 15 The best place to start is the Control Panel Windows 7: Start > Control Panel > Program and Features Windows XP: Start > Control Panel > Add or Remove Programs Dell, HP, Gateway, etc. 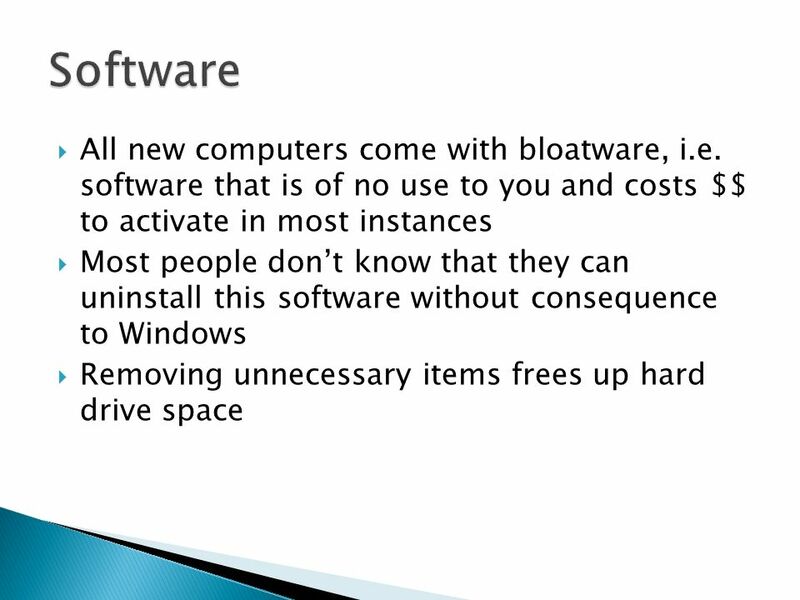 install software that they think you might like but are not free uninstall them! 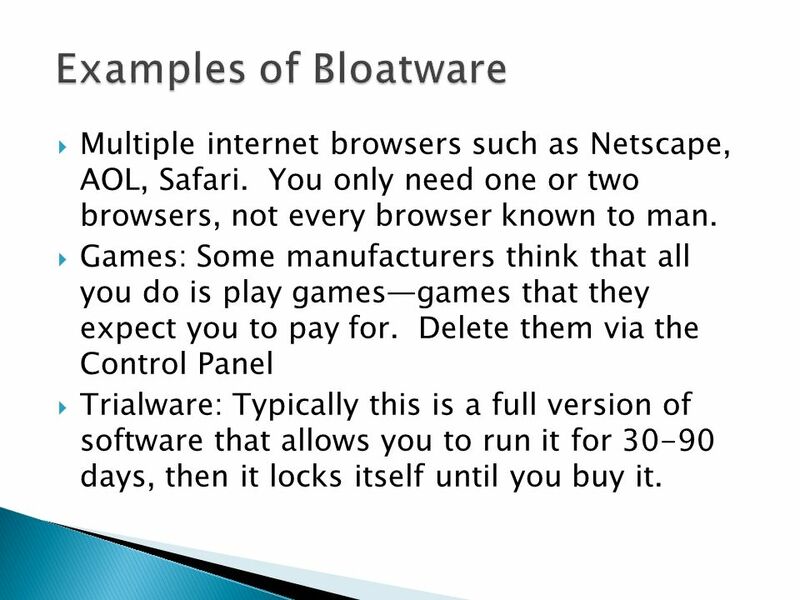 16 Multiple internet browsers such as Netscape, AOL, Safari. 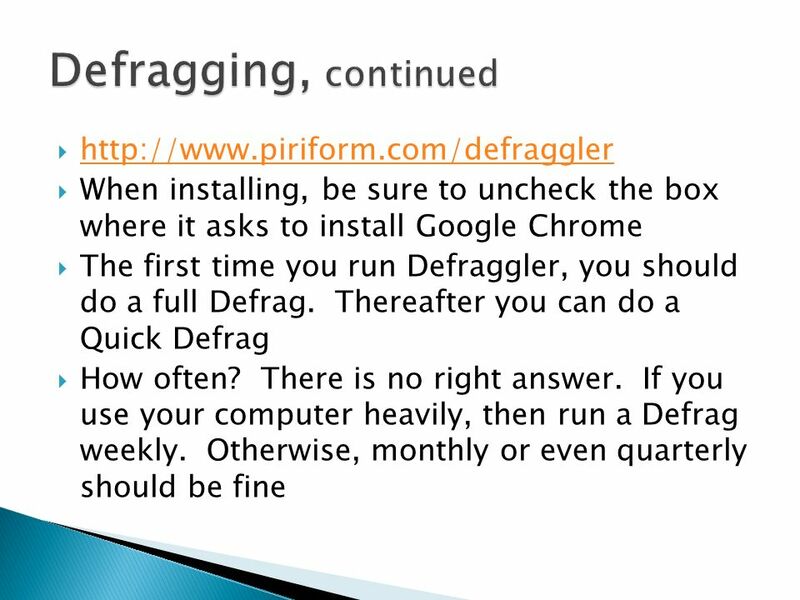 You only need one or two browsers, not every browser known to man. Games: Some manufacturers think that all you do is play gamesgames that they expect you to pay for. 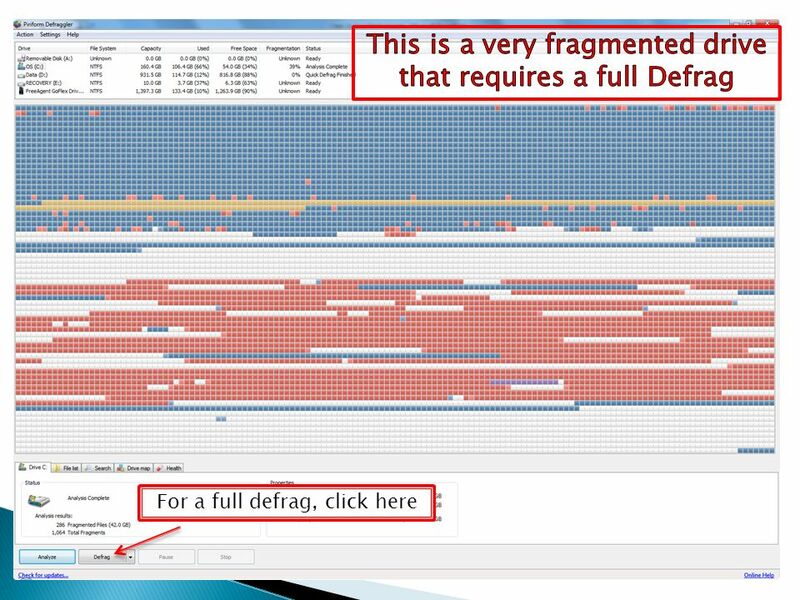 Delete them via the Control Panel Trialware: Typically this is a full version of software that allows you to run it for 30-90 days, then it locks itself until you buy it. 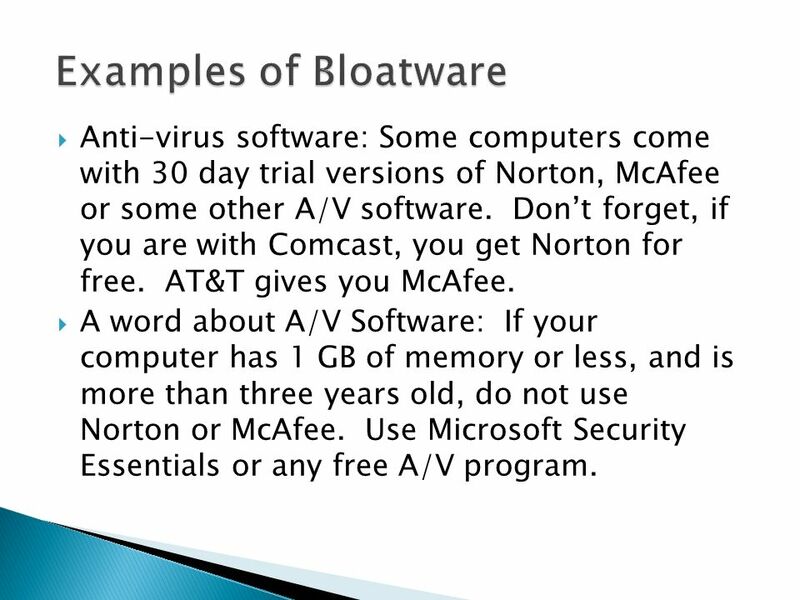 17 Anti-virus software: Some computers come with 30 day trial versions of Norton, McAfee or some other A/V software. Dont forget, if you are with Comcast, you get Norton for free. AT&T gives you McAfee. 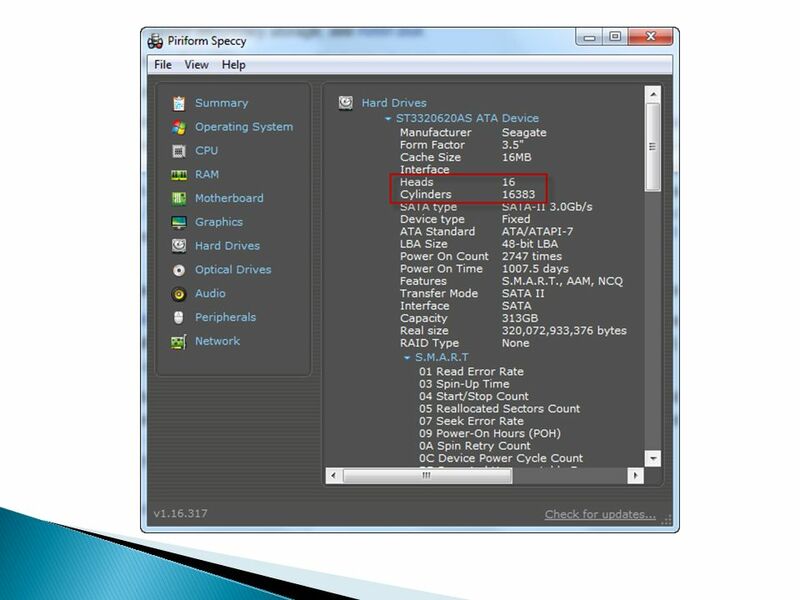 A word about A/V Software: If your computer has 1 GB of memory or less, and is more than three years old, do not use Norton or McAfee. 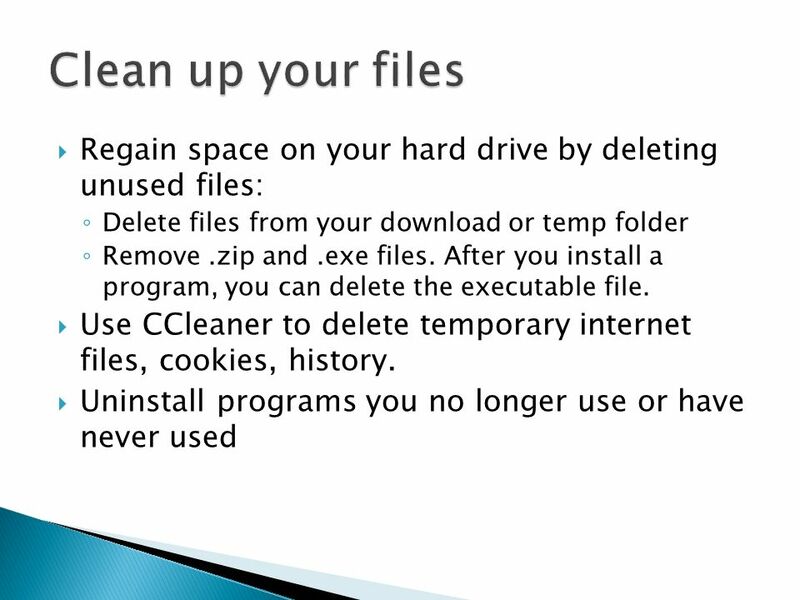 Use Microsoft Security Essentials or any free A/V program. 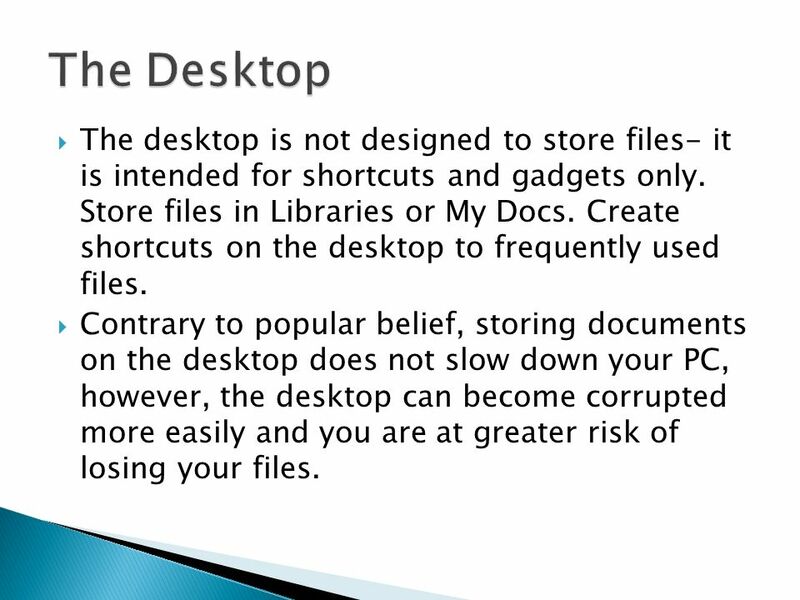 29 The desktop is not designed to store files- it is intended for shortcuts and gadgets only. Store files in Libraries or My Docs. 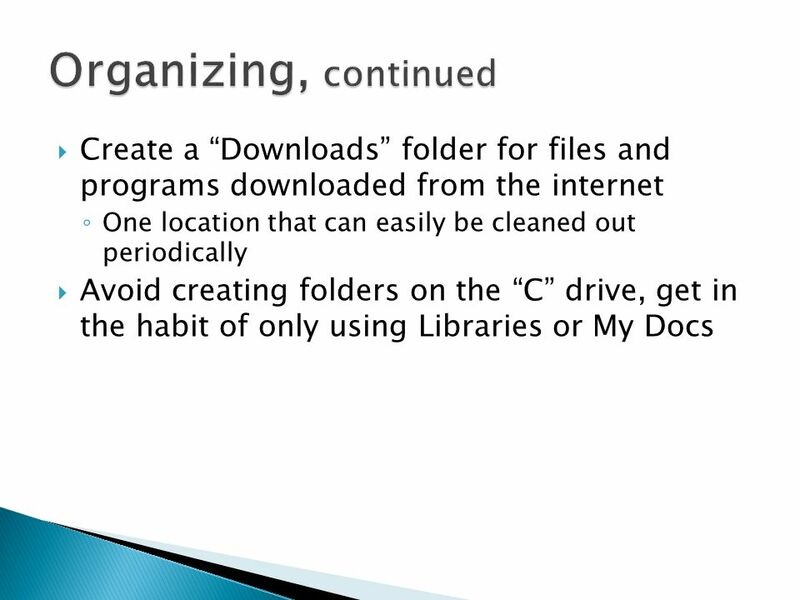 Create shortcuts on the desktop to frequently used files. 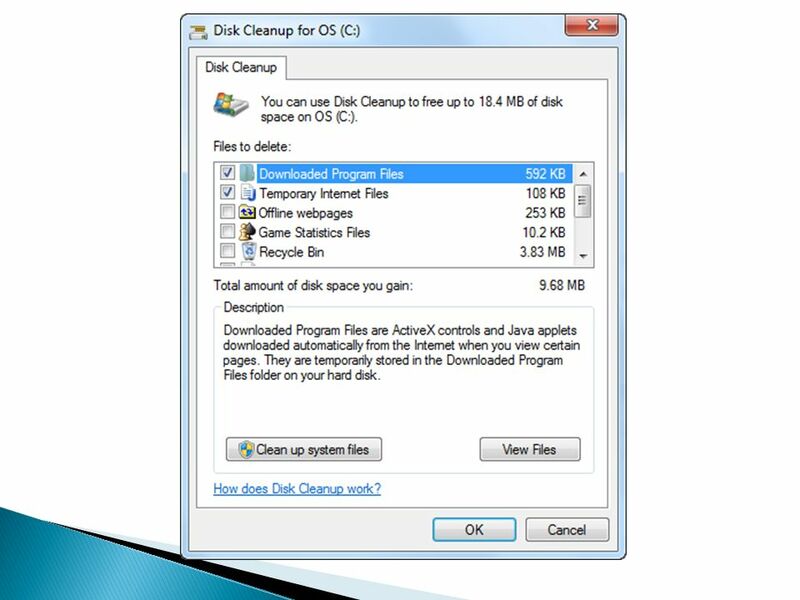 Contrary to popular belief, storing documents on the desktop does not slow down your PC, however, the desktop can become corrupted more easily and you are at greater risk of losing your files. 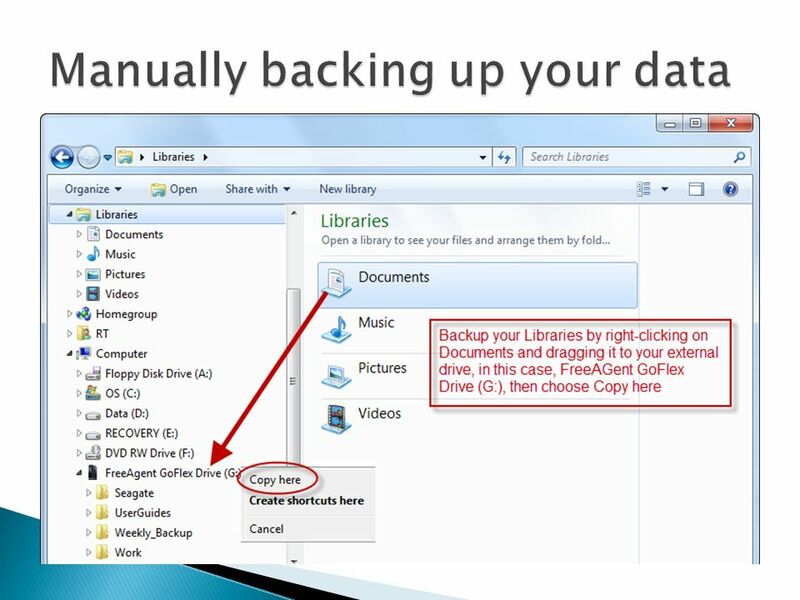 30 Keeping your personal data files in libraries keeps things organized in such a way that they are separated from system and program files. 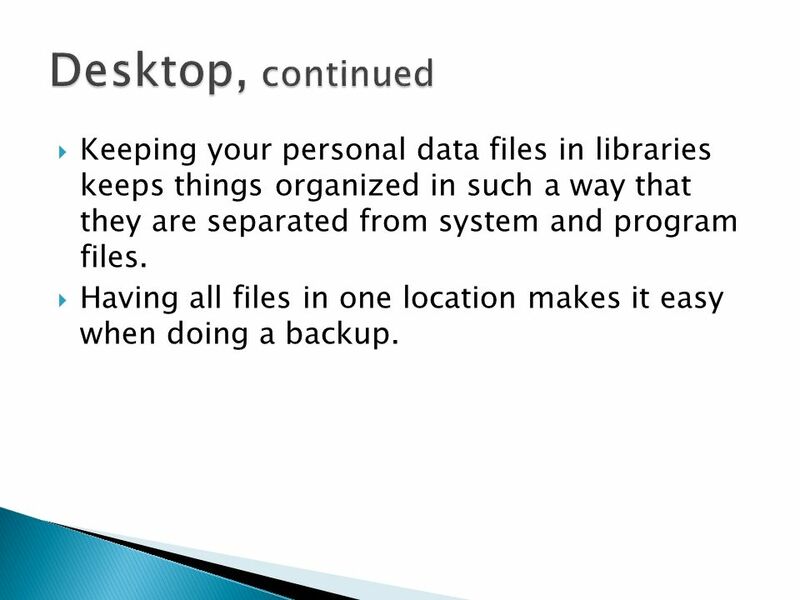 Having all files in one location makes it easy when doing a backup. 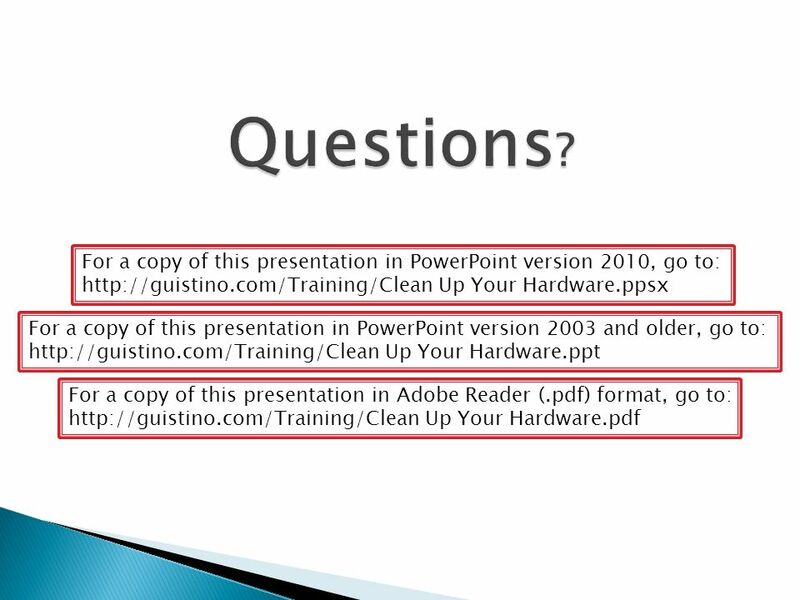 Download ppt "Ross Guistino July 9, 2012 Windsor Senior Computer Users Group." My Computer is Slow What can be done to Improve Performance. 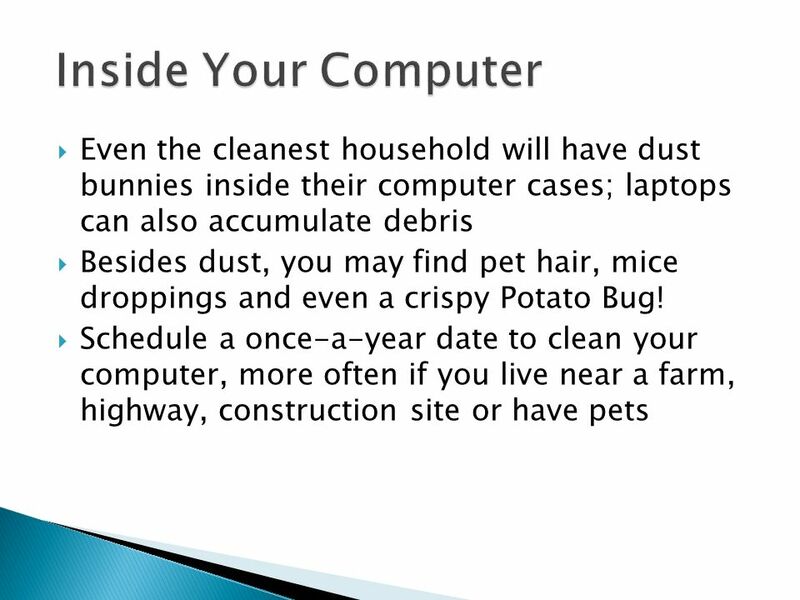 January is Clean Up Your Computer Month! 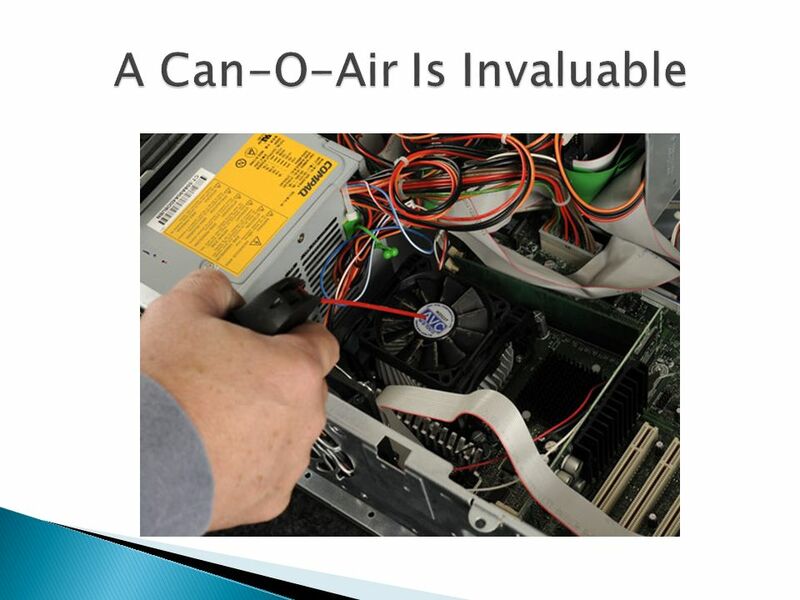 Here are some tips to make your computer run faster! Maintaining and Protecting Your PC David Cox Region VI TLTC Facilitator. 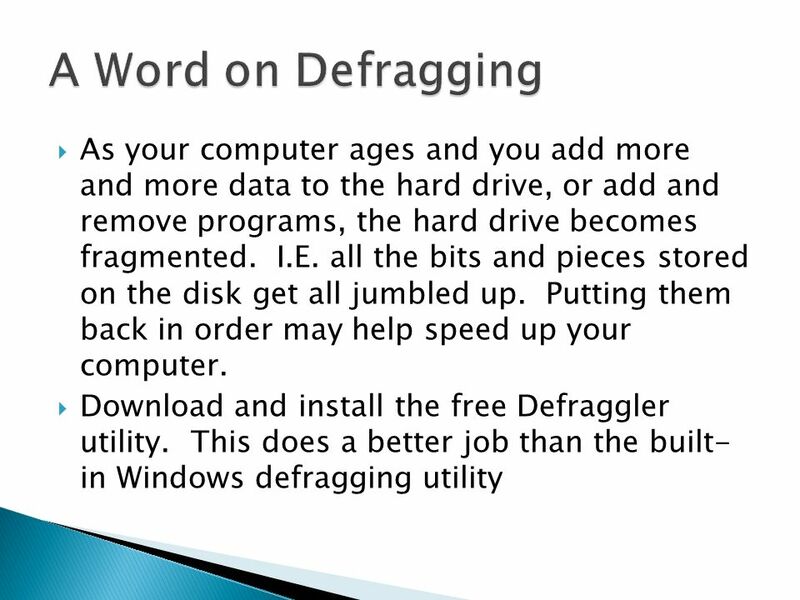 Maintaining and Protecting Your PC David Cox Region VI Facilitator. How to Extend Laptop, Tablet Battery Life. 1. Switch off the wireless connection if you do not plan to access your network or Internet connection. Shutdown the Computer Note : Dont Use Ctrl + Alt + Del. 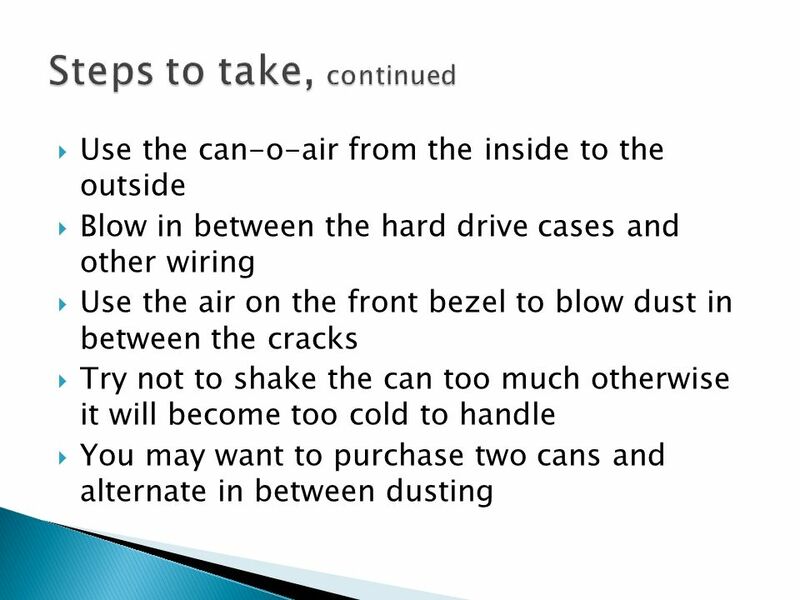 Basic Rules for Taking Care of Your Computer PROFITT Curriculum Computer Basics Module 1 Hardware Concepts. 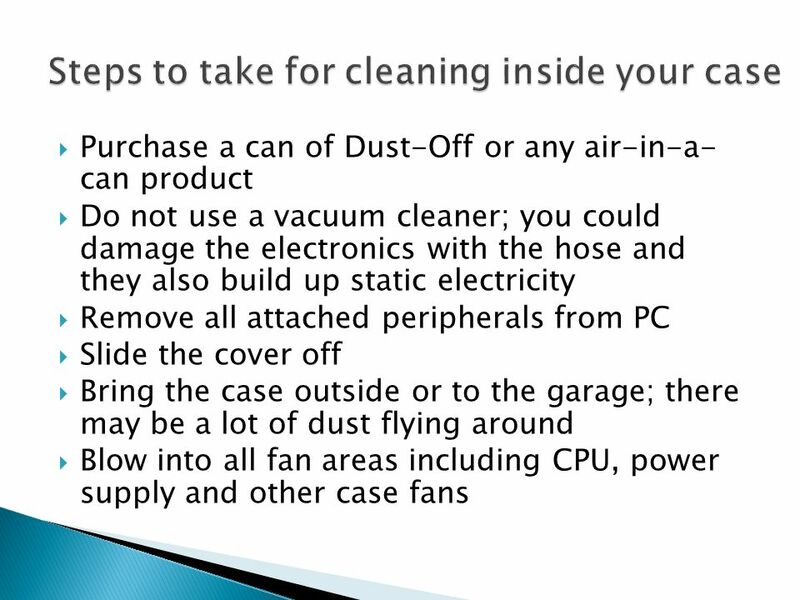 Ways to keep your PC running smoothly  Reboot at least once a week  Make sure fan is free of dust and debris  Defragment your PC once a month  Run. 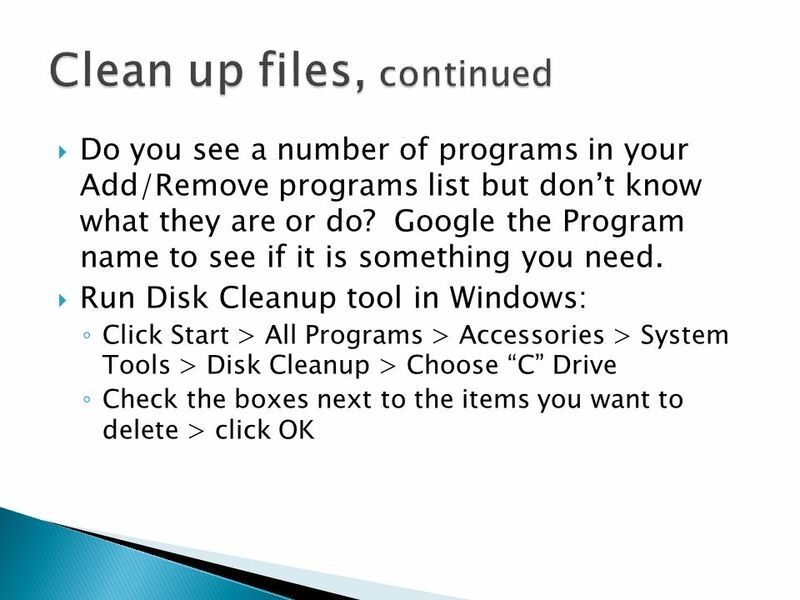 Computer Maintenance Cleaning and Disk Defragmenter Charlie Bou Chantz Martin. 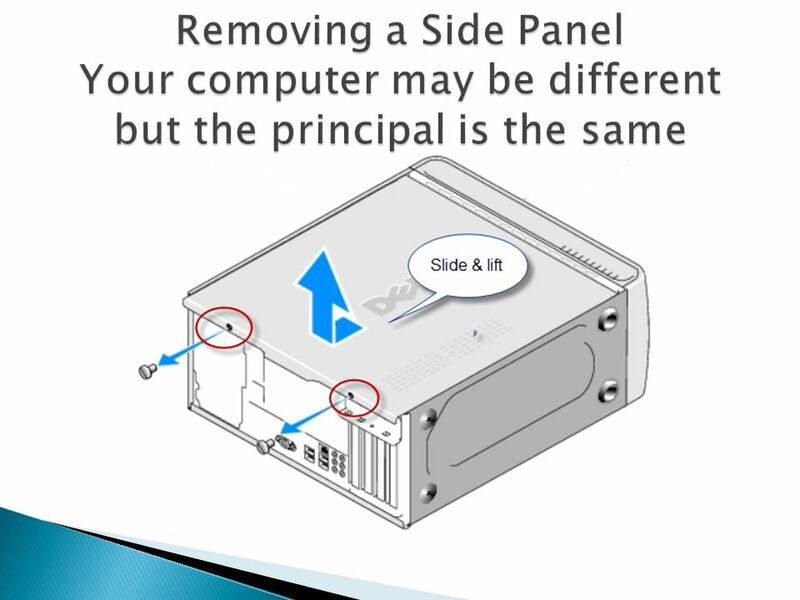 CIT In this chapter you will learn how to:  Care for the external parts of the computer  Describe methods for keeping the inside of the case problem-free. 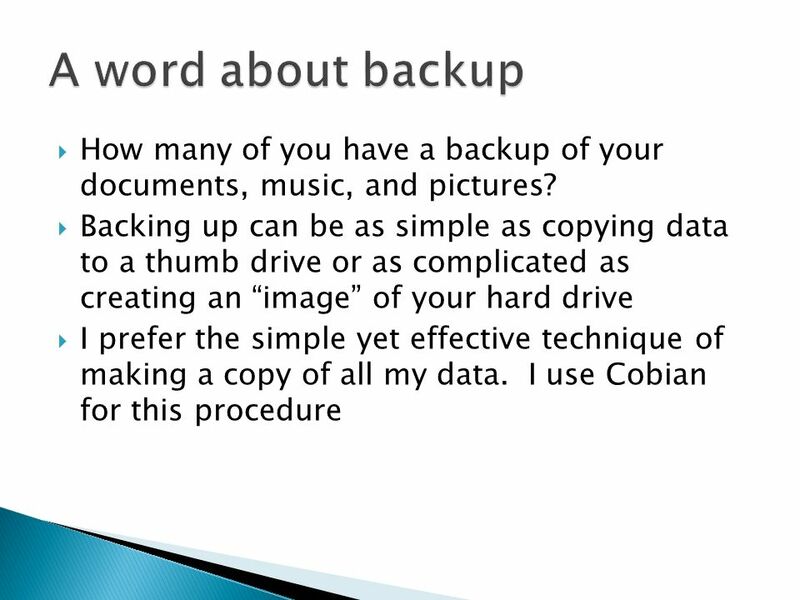 Backing Up Your Computer Hard Drive Lou Koch June 27, 2006. Spring Cleanup 2007 Mike Ramesar Jr of MMD Computer Center Presented By. 5-1note. 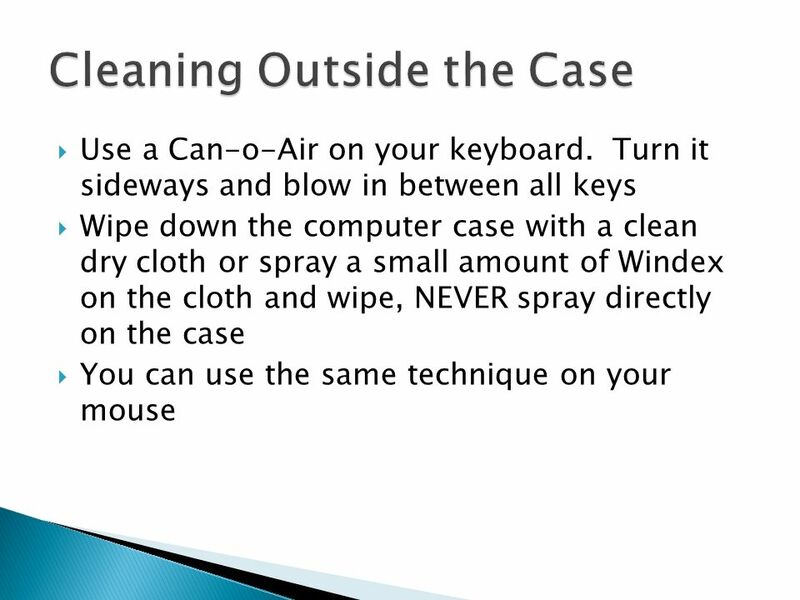 2 BUSINESS TECHNOLOGY TODAY Chapter Five Killer Applications— Using Your Operating System and Word Processor. 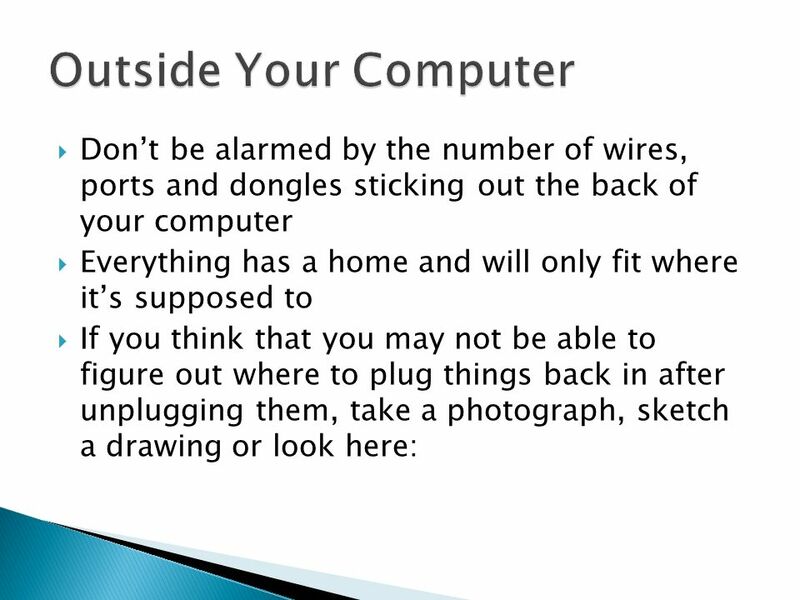 If you use your computer more than a few hours per day, we suggest you not to turn off your computer at the end of the day. Instead turn off only the. 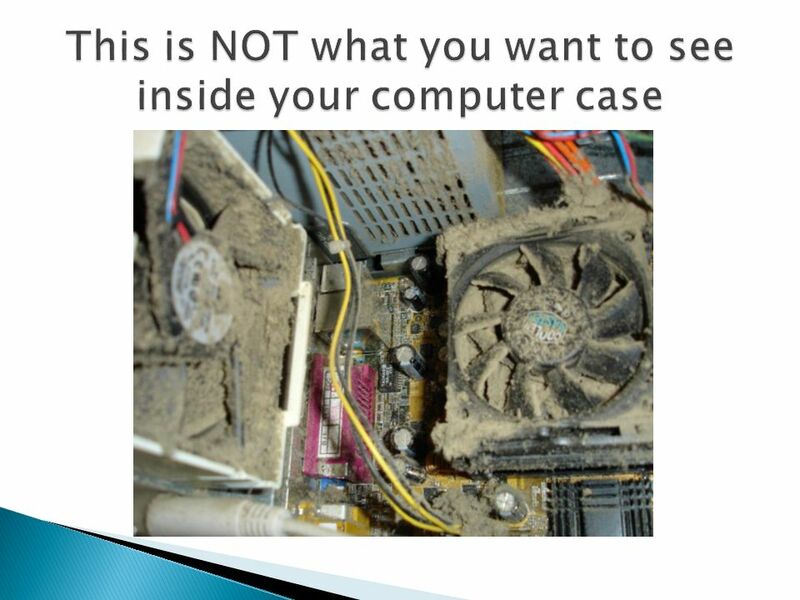 Computer Maintenance & Safety Spring Internet Safety Keeping your computer safe What is a computer virus? A computer program that can copy itself. 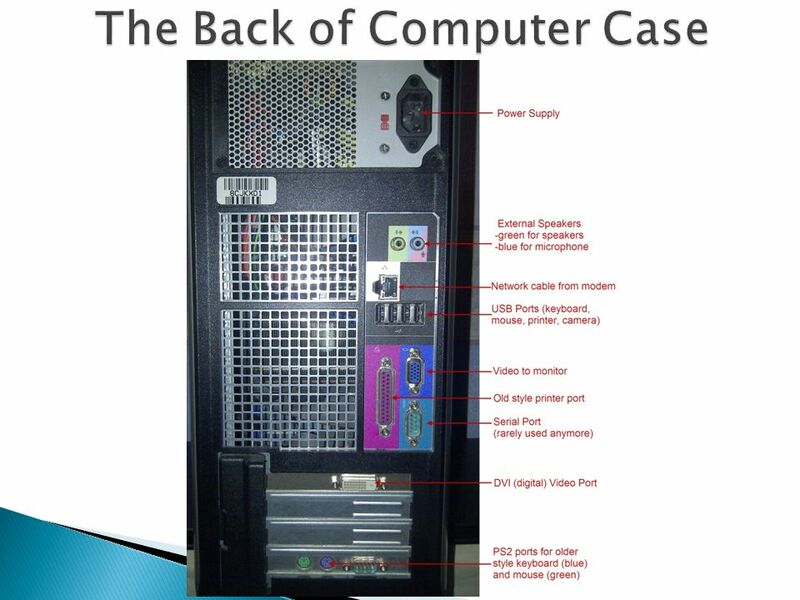 Parts of a Computer Created by Carmen Garzes. An electronic device that manipulates information or data. 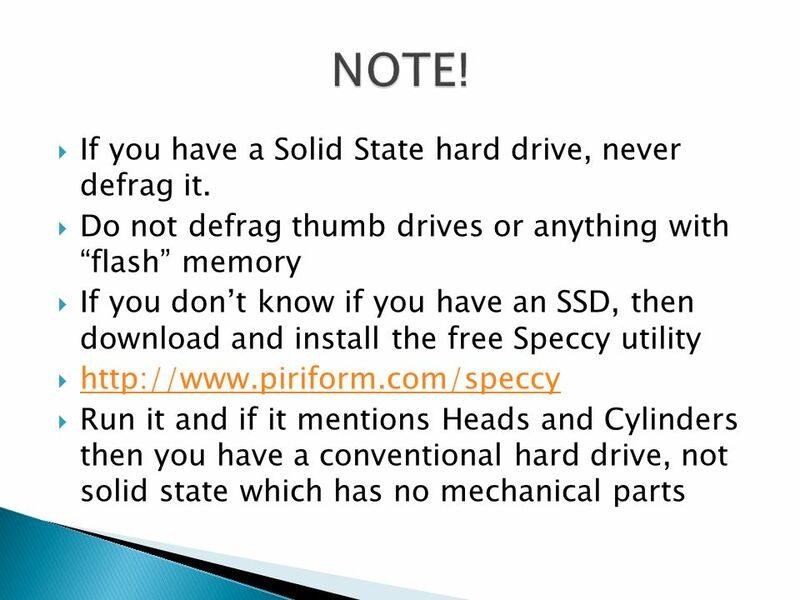 It can store, retrieve or process data. There.